The Keela Belay Pro Jacket is an extremely light & packable Primaloft insulated jacket - simple functional design with excellent performance. 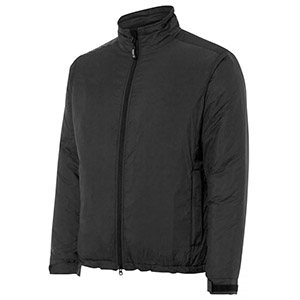 As a mid or outer layer, the Belay jacket excels in price vs performance. Worn to keep winter chills at bay or as a thermal layer under a performance shell for more extreme conditions, it is extraordinarily versatile. The Primaloft insulation is as soft and compressible as down, but suffers no degradation in thermal efficency when wet. The Keela Belay is one of the best insulated jackets that we've tested - lightweight and very warm, the Primaloft insulation (133g/sq m) is perfect for cold conditions where a thicker down jacket would normally be worn. The weight, performance and price just can't be bettered.